In these pages HA Education Manager Melanie Jones shares her own personal experiences and reflections from a recent educational visit to Bosnia, and looks at ways in which British schools might be able to explore aspects of the 1990s Balkans Conflict. 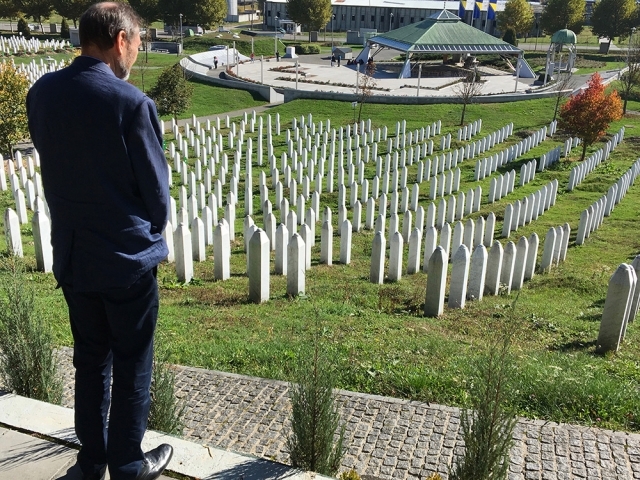 In September 2017 I was approached by a small charitable organisation Remembering Srebrenica led by Dr Waqar Azmi OBE to travel to Bosnia Herzegovina as part of an education delegation. I was to represent the Historical Association as the current Education Manager on this journey to learn more about the region and events in the Balkans in the 1990s. Having watched the Balkans conflict unfold on the news at the time, but realising that I had only a basic knowledge of it, I felt compelled to go on this trip and read other sources to improve my knowledge. It also struck me that it is rarely taught in schools and yet it was a major event of the 1990s. My group consisted of other representatives from education organisations including Citizenship, university lecturers and the National Education Union. I embarked upon the trip with an open mind, knowing that I would be presented with a particular perspective of this highly complex conflict, but with a determination to use this as a jumping-off point to find out more. The tragedy of the conflict in the former Yugoslavia is rarely covered in schools and in fact still remains the preserve of A-Level specifications, and even then only for a single awarding body. The focus of the organisation Remembering Srebrenica is working to ensure that these events in recent Balkan history do not escape historical memory. As in any conflict there are many views and perspectives and what follows does not in any way attempt to tell the whole story, nor does it profess to be the point of view of the Historical Association, but is simply a personal account of my journey to Bosnia-Herzegovina and what I experienced there. I was invited to learn more about the people, place and history and to think about ways in which British schools might explore this recent turbulent past in the classroom.